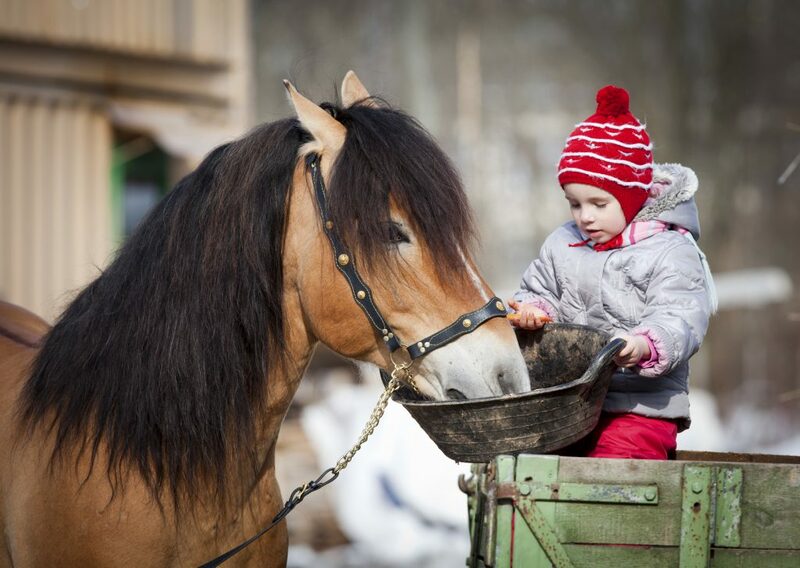 As the cold of winter settles in, prepare to take care of your horses – but not too much care. Coddling can be almost as dangerous as not taking enough precautions. When it’s cold outside, resist the temptation to keep your horse heavily blanketed and locked in a toasty barn without adequate exercise. With the proper feed, water, exercise, shelter, and blanket, your horse will stay warm enough to spend most days in the great outdoors. A thick winter coat is a horse’s natural protection against the cold, providing natural insulation by trapping hot air against the skin. However, if it rains or snows and the horse gets wet, insulating properties are lost, according to the extension service at North Dakota State University. Provide your pastured horses with an adequate outdoor structure for cover, where the animals can take shelter on wet or snowy days. Hydration plays a key role in keeping your horse warm in the winter. When temperatures fall below freezing, don’t let your horses’ drinking water freeze over. Ice and snow are not adequate hydration and will not help keep your horses warm and healthy, according to the agriculture extension service at the University of Minnesota. In regions where freezes are regular winter occurrences, invest in a heating device, or heat your horses’ water to between 45 and 65 degrees, according to the Horse Channel. Staying warm takes energy, and having the proper feed is critical. Many horses experience weight loss during the winter due to using extra energy to stay warm. A layer of fat under a thick winter coat is a horse’s one-two punch against cold – and proper – and extra feeding — is critical to keeping your horse warm this winter. Also, according to the North Dakota University extension service, heat is produced by the digestion of high-fiber feeds, such as hay. 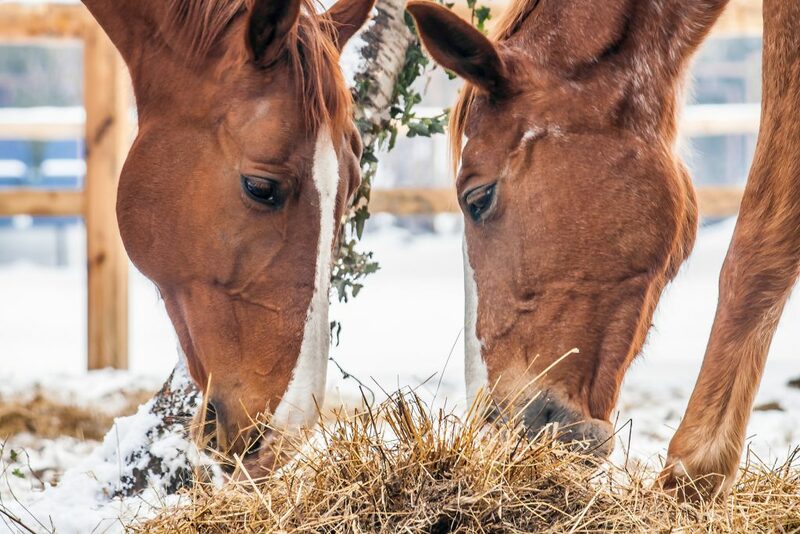 Talk to your veterinarian to determine how many extra portions of forage (hay) to add to your horse’s diet this winter. While curling up in a couple of thick blankets after a few hours outdoors may keep a horse’s owner warm, wrapping up in blankets may not be the best way to keep a horse warm this winter. Unless your horse has recently had a body clip, resist the temptation to pile on blankets, according to the Horse Channel. A horse in good condition, with adequate shelter and a full winter coat, may not need blanketing on most days, according to the University of Minnesota extension. In some cases, a blanket may actually do more harm than good, according to the extension service, inhibiting the ability of the coat to stand up and trap heat close to the body. Using a blanket that is too lightweight may cause the horse to become chilled. When it is time for a blanket –in subzero temperatures — choose a heavyweight blanket with 400 grams or more of insulation, according to the extension service. Make sure blankets are in good condition and properly fitting; an ill-fitting, damaged or dirty blanket can rub, cause sores, or lead to fungal infections. Acclimate horses to cold winter days, but don’t keep him from enjoying the great outdoors. With proper shelter, warm water to drink, extra portions of feed, and the wise use of blanketing, horses will stay warm (and happy) throughout the winter. For all your horse transportation needs, remember to visit the horse trailer professionals at Crossroads Trailer Sales in Newfield New Jersey. This entry was posted in horses, pets, Tips and Tricks and tagged cold weather, horse trailer, horses, winter by admin. Bookmark the permalink.